Sorry for the long break. Just after I wrote the phrase – “peeping into grandma’s kitchen…”, I truly had an oppurtunity to peep into my granny’s kitchen. Yes.. I had been to India and literally had delicacies supervised and cooked by aachi herself and helped by amma. We always start anything new with a sweet dish. 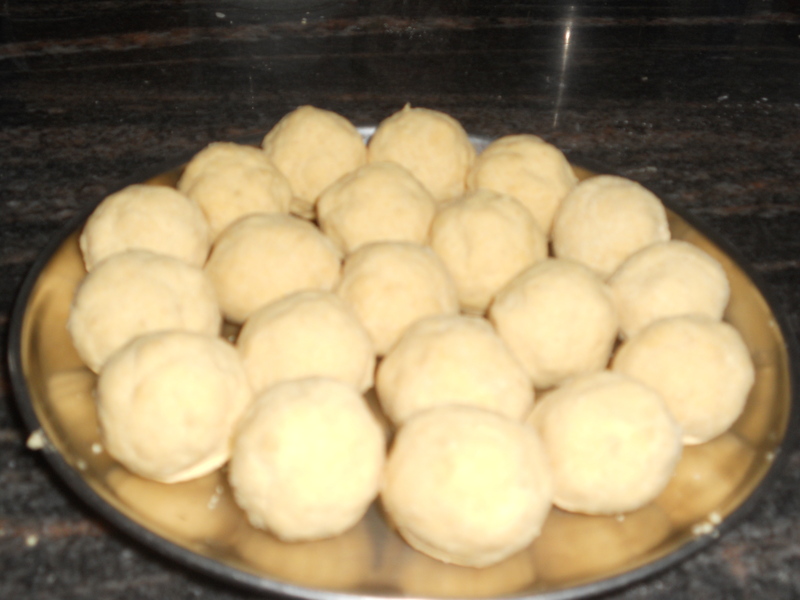 So, here we go – ‘Nei Urundai’ translates as clarified butter balls. Nei is the tamil word for ghee or clarified butter and Urundai means ball. These are cute little balls that melt in your mouth and slide through your throat. Just be careful holding it or having the first bite. It breaks easily. So just handle it like a newly wed wife. Bet you wont stop with one – the sweet balls or the urundais I mean! The quantity of the ingredients is before roast and ground. Take one cup split lentil, roast it in any pan and grind it fine. Usually it is done in bulk in any grinding mill in India. (It might not be as fine if done in a dry grinder at home – but its okay). Even after very fine grinding in a dry grinder if you find hard granules, you can sieve the powder. Powder the sugar and add both dry ingredients in a wide vessel. Heat the nei in a separate deep pan. The heating consistency of clarified butter is very important. When the clarified butter is really hot, take a teaspoon of it and pour it in the lentil-sugar mixture. There should be bubbles coming up. This is the right heat. Pour the total nei at one go and mix it randomly. Make medium sized balls when the mixture is really hot. This helps in binding the balls well. Its done and ready to taste!! The above quantity would be sufficient to make 20 urundais. I defnately miss all those days of fun & that morning coffee!!! yes. that is on my list too. Might be after I make it in a few days. surely we miss the eating and chatting at thatha aachi’s house when we were younger..